What if there were a way to replace missing teeth that didn't involve any expensive surgical procedures? What if there were an affordable method of tooth replacement that didn't sacrifice aesthetics? What if there existed a partial denture that could actually blend in with your natural dentition so that it appeared invisible in your mouth? It was long thought that removable partial dentures had to be rigid to be effective. The innovation of the Valplast® Flexible Partial allows the restoration to adapt to the constant movement and flexibility in your mouth. This is the underlying thinking behind Valplast's innovative flexible, removable partial denture. The flexibility, combined with strength and light weight, provides total comfort and great looks! 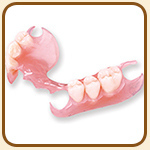 Valplast® partials are custom-fabricated in a dental laboratory. They are a prescription only product and your dentist can help you decide if they're right for you. The preparation is relatively simple because your natural teeth don't need to be altered in any way. The Valplast® partial is virtually invisible because there are no telltale metal clasps, and the material itself blends with the tissue in your mouth so that the only thing that shows is your beautiful smile.